I’m not a huge chicken salad fan. I don’t like it when you can’t really see all the ingredients and it’s all one color. And since I don’t like mayo, I typically find chicken salad pretty gloppy (that’s my word I use to describe mayo). But over the years, I’ve developed a recipe for chicken salad I like a lot, and I think it’s really pretty, too! I love the tart apples and the sweet grapes, along with the crunch from the celery. Add the toasted almonds right before serving for the best texture. I like to serve it with this cranberry pecan bread from local bakery, but crackers or any bakery bread would be great, too. 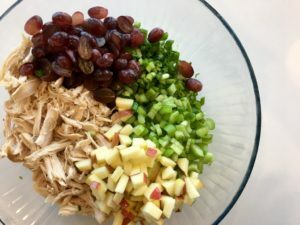 Combine the chicken, green onions, apple, grapes, and celery in a large bowl. Mix up the dressing by whisking together the yogurt, mayo, sugar, lemon juice, and salt and pepper. Pour the dressing over the ingredients and stir together. Chill for one hour or longer, overnight is best. Before serving, top with toasted almonds. 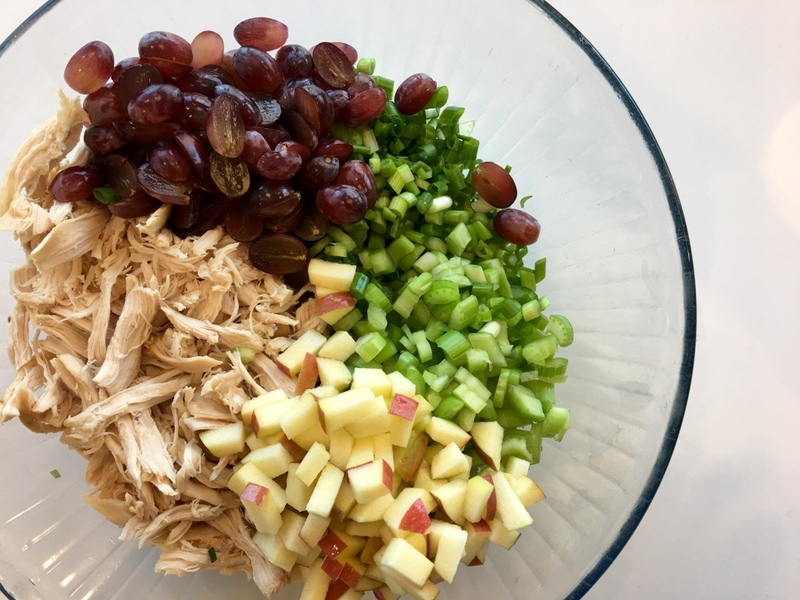 Copyright © 2016 Our Everyday Dinners - This is an easy recipe for how to make Chicken Salad.